"This is so boring without drugs." 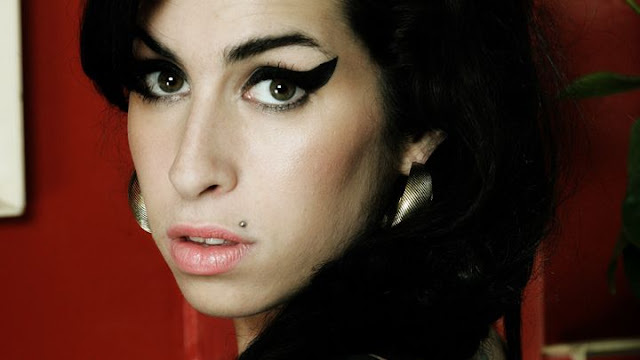 Amy is a wonderfully polished, nuanced, and wholly devastating exploration of the entirety of troubled singer Amy Winehouse's short life and career. Senna director Asif Kapadia's extensive use of impeccable quality archival footage, home videos, and personal accounts paints a fluid, deeply psychological look at everything Winehouse was at her core as a friend, daughter, lover, and human being. Amy is truly a high achievement in both documentary filmmaking (of real events after the fact) and the musical genre of non-narrative biopics. Winehouse's talent and sophistication comes through in countless genuine moments of her musical expression and work. We see how her steady rise to fame and celebrity destroyed her personal life. Her incredible success and raw appeal was her ultimate downfall in the way it brought the people around her together in a lifestyle destined to ruin her. Despite all the trouble, her problematic childhood, relationship with father Mitch Winehouse, who's heavily featured but has since denounced the film, and a Sid and Nancy style love affair with ex-husband Blake Fielder-Civil, her humanity and amazing qualities as a person shine through. It's remarkable how completely fleshed out these intertwining and conflicting relationships are done entirely without expository narrative voiceovers or talking head interviews. Told chronologically and edited rather seamlessly, live performances and voice clips mixed with the copious amounts of interviews and media footage make her life under the public eye all the more tragic. We see her control (and subsequent lack of) and decision making for all its flaws and doom in a very honest and raw representation. Amy is only so sad simply because Amy the person was so appealing. It's an utterly heartbreaking portrait of such a versatile and singular talent destroyed by everything she was and everyone around her (not necessarily of their fault). Despite the real-life knowledge of her untimely death at age 27, the film is so compelling and dramatic at every turn with every aspect of her life unfolding like both the tabloid it was and the constant internal conflict stirring within her. She wanted to be loved and was but it never seemed enough for her or anyone. Kapadia's documentary is truly as fascinating as she was along with everything about her.